With many now getting their news from comics like Jon Stewart and Stephen Colbert, the presence of a respected newsman regularly delivering nightly news may seem an outdated medium, but in his biography – Cronkite – Douglas Brinkley humanizes a legend. The size of this book can be intimidating – over two inches thick, a companion to a good Oxford dictionary, but two sixteen-page inserts of photographs might be a good place to start. 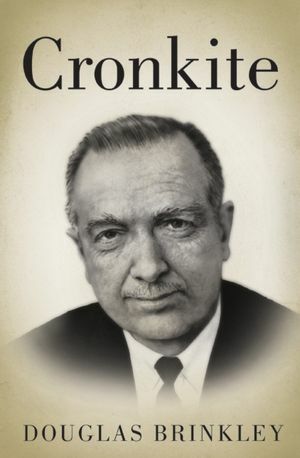 The next 5 chapters document Cronkite’s life and career through World War II, the moon landing, the death of President Kennedy, the Vietnam war, and finally “Retirement Blues” at 64 years old. Brinkley conveniently prefaces each chapter with a list of its subtopics, effectively summarizing the key points. As I am reading, I find myself skipping around, looking for topics that interest me – in no particular chronological order. No matter what point in history, Brinkley manages to insert anecdotes about Cronkite that place him not only reporting but also shaping events. Cronkite’s bugging of a political convention room surprised me. This entry was posted in American history, biography, book review, books, nonfiction, reading and tagged biography, Cronkite, Douglas Brinkley, Edward R. Murrow, Houston, Lowell Thomas, Missouri, newsman, Vietnam War, Walter Cronkite, World War II. Bookmark the permalink.